The most important thing would be the turkey. 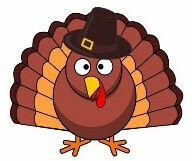 Frozen turkeys are available in the large supermarkets in the major cities, although extremely expensive. We had even seen them at one supermarket in La Esperanza. But living in the Frontera of Intibucá presents particular challenges. Carrying the turkey on a bus for four hours, having it partially defrosted and then needing to refreeze it, was not possible. We talked to our neighbor who assured us he could get us a turkey from a local farmer. It would be slaughtered and plucked, ready for us by Thursday morning. Turkey secured, we needed to work on the incidentals. Dressing, mashed potatoes, fresh fall vegetables, gravy, cranberry sauce, rolls, and of course the all-important pie, especially pumpkin pie. Dean and Melissa, a couple we know from La Esperanza, who run a religious NGO, committed to coming. They would bring two interns. As important, they would bring a stuffing, a southern- style dressing, and a pumpkin pie. Kate from Shoulder to Shoulder committed to coming. She would bring fresh made rolls and banana bread. She would also bring Joshua, a med student at the University of Rochester spending ten months in San José doing a census study for Rochester University’s continuing work there. We had not met Joshua nor one of the two interns. Kate had not met Joshua, Dean and Melissa, nor the interns. Joshua had never met anyone. But we all shared being American and looked forward to this unique celebration. It seemed all was so well prepared, planned out to the most minute detail. I, for one, was very excited, as I’m sure everyone was. The first tragedy was the turkey. On Wednesday afternoon our neighbor informed us he couldn’t find one. We ran out into the town and found the local store where we could buy frozen chickens. We bought two five pound frozen chickens. It was a disappointment to be sure, but we could still make it work. The electricity had gone off early in the day, at around 12:30 pm. This is relatively common and we had no reason to believe that it would be a problem. At 7:00 pm it was still off. We couldn’t bake the cake we wanted to bake in the evening. Still, we could probably shuffle the use of our oven among the chickens, the sweet potatoes, and the cake on Thursday. No big deal. Oddly when we woke up on Thanksgiving, the electricity was still off. My anxiety rose as the hours, 8, 9, 10, and 11 am, passed. Our guests would be arriving at noon. We had no food to offer them other than chips and warm drinks. Something had to be done. Laura had the great idea of bringing our chickens to the Chinese restaurant (the only restaurant in town) and asking them to cook for us. They agreed. 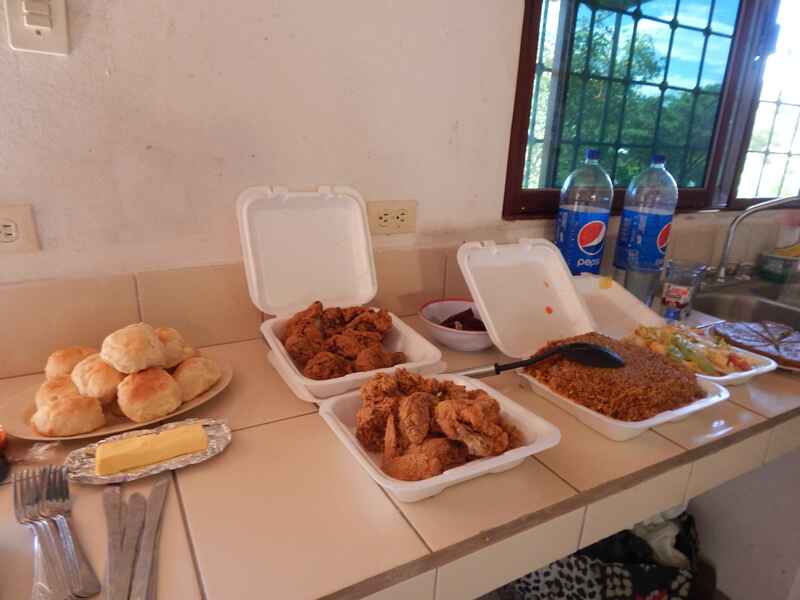 But you can only imagine that a Honduran running a Chinese restaurant in Concepcion, Intibucá has a very limited understanding of traditional, Thanksgiving cuisine. Not having an oven himself, but only a gas stove top, he deep fried the chicken. Additionally, he sold us fried rice and salad. Dean and Melissa and the two interns arrived, from whom we learned that the power was off in La Esperanza as well, and probably in most of Honduras. In fact the electricity did not return until Friday at 7 pm. They bought a chocolate cake they purchased at a bakery, but no dressing, no stuffing, and (horrors of horrors) no pumpkin pie. Kate and Joshua arrived shortly after that. Kate was able to quickly bake her rolls and banana bread on generator power the night before. Our Thanksgiving fare had been radically reduced: fried chicken, fried rice, salad, rolls, banana bread, and chocolate cake. Ah, I almost forgot, we did have a can of cranberry sauce, a clear symbolic remnant of the pilgrim/indigenous celebration. We sat down to eat, without the need to carve anything. Thanksgiving feast ala Chinese style! Miraculously, however, without the proper fare, without true family with generational commitment, without Macy parades or football, without falling asleep because of the tryptophan, and even without pumpkin pie and a dollop of whip cream, it still felt like Thanksgiving. We talked, we laughed, we shared stories mostly about what had brought us to Honduras. We gave thanks for one another, our sharing, and our freedoms. Apparently, even without everything we think makes Thanksgiving, we celebrated a bounty. Happy Turkey Day, with or without the turkey. The post above is the same post I published at Shoulder to Shoulder’s web page. You can see what Laura and I are doing by going to: Shoulder to Shoulder. You can also get updates on what’s happening at Shoulder to Shoulder by going to: Shoulder to Shoulder Facebook.